Basil Essential Oil - Amphora Aromatics Ltd – Supplier of pure essential oils and aromatherapy Products. 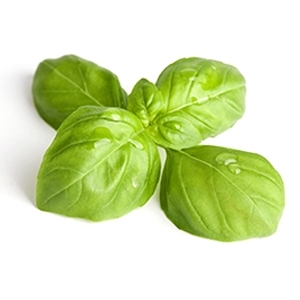 Basil is commonly used in the treatment of most kinds of respiratory problems such as bronchitis and whooping cough as well as many conditions that cause a fever. A massage treatment including Basil is often used to treat digestive difficulties such as constipation and also period pains - it's massaged gently on to the abdomen. Basil is not normally used on it's own in massage but is blended with other oils (see Blends Well With below). It's found in sporting massage treatments to ease achy, tired and tight muscles. Dancers and athletes especially benefit from a massage blend that includes Basil. It can be an irritant to the skin (especially to those with sensitive skins) and so should always be well diluted before application to the body. When burned or vaporised Basil is used to clear the mind, promote positive thinking and lift the spirits. It can also help to relieve headaches and migraines (particularly stress related) and may help to clear the respiratory system. Essential oils generally blend well with one another. You may find that Basil blends particularly well with Bergamot, Black Pepper, Cedarwood, Fennel, Ginger, Geranium, Grapefruit, Lavender, Lemon, Marjoram, Neroli and Verbena.